I'm up late tonight waiting to be activated for weather coverage on an approaching complex of storms. I'm basically writing in a race to finish before the gust front moves into our listening area. I've had these little races with Mother Nature before. I think it'll be okay. I've written about my abstinence from sugar and how its given me a peace and calm like I've never known. It's not something necessary for everyone. You may not have the reactions I do when you consume sugar. Arriving at this point in my journey has required a bunch of trial and error, or more accurately, a bunch of denial and struggle. I'm glad I've experienced things this way, though. Because without the trials, the struggles--I wouldn't be where I am today. And I love where I am today. If you're not someone affected by sugar, like me, good! For you, moderation is key. After experiencing the last nine and a half weeks without and the resulting peace and calm--I've never been more sure of its affects on me. When denial and struggle is replaced with the positive perspective of peaceful acceptance, it's life changing, certainly has been for me. I lost 275 pounds eating cake, ice cream and desserts--all within reasonable portions at appropriate times. Using prior success as a reference, It made it very hard to get to a place of acceptance for abstinence, where I am now. In hindsight, I clearly see how my support and accountability system importance level was set so high, I didn't dare give in to the struggle, temptation and the obsessive like attraction to "getting more." There were a lot of prayers and meditation--surrounding myself with people, instead of isolating--and connecting as much as possible with a variety of support sources. When the bio-chemical reactions of sugar addiction swirled through my brain, I followed its lead without question--as if possessed. I traded one struggle for another. Instead of struggling against the compulsions to binge, I gave in--then struggled with the regret, shame and embarrassment associated with weight gain and the guilt associated with doing the very things I wanted to be diametrically opposed to. I was very much NOT wanting to let go of the sugar or, the option to enjoy it occasionally in portioned doses... My denial was slowly revealed and chipped away by learning. What ended up happening is, I kept researching the effects of sugar, specifically the addictive nature of it, and then as if I was destined to hear--I kept having conversations with people in recovery from food addiction---people who have what I want--years of maintenance behind them--and 100% of them said the same thing in relation to sugar and how it creates a bio-chemical reaction in our pleasure sensors---and then sets off the addictive cycle of, "I gotta have more and NOW!!!!" I can't say I'm 100% sugar free, because of my non-flavored plain coffee creamer. The tiny amount doesn't seem to have the same effect as larger more obvious amounts. I'm sugar free enough to experience the most amazing benefits I once thought were impossible to find for me. No binges and no urges to binge. So many people described their experience to me--and they described this feeling--but still, until I actually committed to the effort needed to personally "test" it, it was like they were speaking of some mythical fantasy. I do recognize that I have a similar and many ways stronger support and accountability system in place now--but even still--I'm not fighting to maintain control. There's a peace and calm about my approach that I'm absolutely in love with. If trading the occasional sugar for this feeling is the deal...then I'll sign a lifetime contract. That's the long answer to my perspective. Will I ever go back to eating ice cream, cakes and other sugar laden things? I pray I never do. My short answer is no, I don't plan on ever going back. I now know, understand and appreciate what I must do in order to stay abstinent. I also know that if I ever decide to abandon the principles and practices of my personal recovery, I'll surely go straight back to the very familiar reality of an unmanageable and chaotic existence. We've expected these storms moving in overnight since this morning. With this knowledge, I was able to plan my afternoon with a solid nap in place before heading to the YMCA for a workout. I experienced a wonderful ride on the elliptical tonight before meeting Amber and KL at my favorite little Mexican place for Hawaiian Fajita Tacos! I had a wonderful visit with Amber tonight. It carried over past dinner, to their apartment afterward. Amber has a big opportunity in front of her and tonight she needed some fatherly advice and encouragement. Nothing feels better than connecting on deep levels with my kids. It's a fantastic feeling. My plan today included cleaning my apartment, taking care of a friend's dogs, cooking some great meals, working out at the YMCA, a quick grocery trip (more fruit and coffee), visiting with my youngest daughter Courtney and grandson Noah, writing this blog update and actually getting to bed a time appropriate for someone who gets up at 4:30am. I have writing, grocery store and visiting left on my list--oh, and dinner. Right before bed, I plan on making some rounds to my favorite blogs--reading some and offering support. I usually do that well on the weekends, but my schedule this weekend has been kind of different. I can see where my continued success might appear to be hoisted up by an all consuming schedule of writing, exercising, cooking and tweeting. It's really not. The fundamentals to my plan each day--when all goes well, run like a computer program in the background. My life is happening just as it was when I was struggling horribly. I still have job stress, financial stress, occasional inter-personal relationship stress, scheduling stress--where the only way to make it better is to become better at time management--and yet, I'm giving thanks each day for another successful day of taking extraordinary care. The "program," my program--runs in the background 24/7. This peace and calm I've written about lately is when I'm handling life in the foreground while my program is running quietly and consistently in the background. The background program enhances the foreground program in many ways. Nearly 100% abstinence from pure sugar has made an impact I had to experience for myself to fully believe. The absence of the binge behavior and urges to binge have been nothing short of miraculous. And should I ever conveniently forget about what sugar does to me, it'll be like a virus infecting my background program. I'm extremely protective of my background program! My commitment and diligence each day is like antivirus protection. Staying supportive of others, keeping an open mind, prayer, meditations, positive visualizations and moving forward one day at a time is like keeping that antivirus protection updated. My next weigh day is this coming Wednesday. I'm looking forward to stepping on the scale for my 10 week number. And that's all it is, a number. Never again will it define my worth and identity. The number will only serve as a statistic and guidepost toward my ultimate goal of getting back to and successfully maintaining a healthy body weight. I'm seriously considering adding some calories to my budget. If I do, they'll be good calories--proteins--and things that will help me as I start using my newly acquired NordicFlex weight training machine. But I'm still not sure if those changes will come after this 10 week weigh in or the 13 week mark. I'll see how I feel when the time comes. I'm not hungry. I'm eating well and it seems enough. I could stand a little more water. Most days I struggle to hit the minimum 64oz. The water and time management--these are two important things deserving of my attention. And I have been doing better on these two. Sometimes the schedule gets out of my control--especially when storms roll in and I find myself on the air for coverage, often in the middle of the night. No complaints really--I'm compensated for it--and I'm thankful for the job. Weather coverage and other scheduling challenges are most usually things I can anticipate and do my best to make sure it doesn't completely throw me into a tailspin. I must give myself a pat on the back for taking better care in these departments. I've really made some positive strides. I'm having so much fun sharing my meals, exercise and occasional humor on twitter. If you want to join in, simply go to www.twitter.com/seanaanderson If you're not into food pics and calorie counts--you might want to skip it. It's every single bite, every single day--photographed, described, calorie counted--and tweeted. Too much? For some, yes. For me? It's doing wonders. It's working. And this is what this journey is all about--finding what works for you. I'm finding what works for me and it's constantly running in the background of my life. Thank you for reading! I'm off to the store, to see Courtney and Noah--and then a late dinner of some sort. I had a late lunch at a little after 4pm--so I'm not hungry--hoping to feel like something before too long. I have 800 calories remaining...yikes! This is one of the challenges of the weekend--proper calorie management. It's hardly a problem during the week because of my schedule starting so early in the morning. It was tough to get out of bed this morning after last night's late on-air weather coverage. I was getting up early to help some friends load their moving truck. I'm so glad I did because it felt good to help and it was one of the best workouts I've had in years. I made sure to take time for breakfast preparation and preparing a sack lunch for the inevitable lunch time break. Lunch ideas were tossed around. Fried chicken? BBQ? Pizzas? It didn't matter to me, I had planned, prepared and packed my lunch. I was hoping they would order out and everyone eat at their house, but the decision was made: The lunch break would be at the pizza buffet place. At first I agreed to go too, taking my food with me. Then suddenly I started worrying about what might happen if I took my outside food into this restaurant. Would I be told I couldn't by the manager? Would people look at me in a strange way? Everyone was already in their vehicles when I decided I just couldn't do it. I asked my friend, "Do you mind if I stay here and eat my lunch? You guys go ahead and enjoy, I don't mind. I just didn't want to take my lunch into the restaurant." He understood and said he didn't mind and we parted ways. I decided to drive home and eat lunch. I was almost to my apartment when I had a revelation. I'm going to the pizza buffet place!!! I'm going to enjoy lunch and conversation with my friends. Part of the freedom included in the epiphanies discussed in the May 15th post involve caring much less about what others think of me. I'm confident in who I am. There was a respectful way to handle this restaurant situation without creating stories in my head about how the management and diners would react to me bringing in my own food. Who cares? If it's an issue, I'll leave, I thought. After accepting then abruptly declining the lunch invitation, then having a sudden change of heart and going anyway, I kind of felt like I was in the middle of an internal tug of war. But now I felt empowered and determined to enjoy my lunch while visiting with everyone else. I pulled into the parking lot, grabbed my lunch bag and without hesitation, headed for the door. Instead of sitting down and feeling like I had to conceal my "outside food" that was possibly breaking a common policy many restaurants maintain, I went straight to the counter. I was greeted by a very nice lady, I asked if she was the manager--she said yes, and then I explained what I wanted. I opened with a compliment: "I love how you've remodeled the place! I'm with the party of eight in the room over there, but I'm on a special food plan. Would it be okay if I eat the food I brought while they eat your buffet?" She replied with a smile: "That's fine!" Okay, that went way better than I imagined. I added, "do you mind if I use a plate and order a water? I'll be sure to tip!" Again, "that's fine, no problem." I didn't make a big deal about it. I didn't talk about my food until someone at out table asked me to describe what was on my plate. Honestly, I don't think anyone else away from our table even noticed. I quietly took care of me, doing my thing as everyone enjoyed wonderful lunch conversation. I participated in the fantastic conversation too and as I did, I couldn't help but smile inside because I felt wonderful about my decision to join the group for lunch. And to think, I almost didn't because I was allowing my imagination and fear to mix into an unrealistic expectation. There wasn't a stern manager telling me to leave...I didn't get strange looks at me or my food...just a wonderful lunch experience with some of the best people I know. What also stood out in a profound way, was how content I was. There wasn't a struggle passing by the above described buffet line. My mouth wasn't watering at the site of other people's food. I didn't feel deprived in the least. It wasn't will power. Will power is when we're exerting a large amount of energy in an effort to keep ourselves from doing or having something we really want. It didn't require will power because I didn't want. That's a big difference. The key to this difference is found in focusing on the perspective that says, isn't it nice to have such a wonderful visit with friends? Isn't this lunch delicious and satisfying? And not: I can't have what they're having. Because clearly, I could--and for free, my friend's were picking up the tab. And that's an important distinction. It wasn't that I couldn't eat what they were eating, I could have easily. I didn't want to for very good reasons. Just to clarify, had it been a restaurant with items I could order and feel good about, then I might have returned my prepared lunch to the fridge, saving it for later. My recovery from food addiction is something I take very seriously and if I'm ever in doubt about what's available where I'm headed, then I'll always be sure to bring something with me or wait until I have access to something I can accept. I had no idea of the lunch plans today, so I adequately prepared myself, and it paid off handsomely. I managed my calories with intention and deliberateness today. I did well. My workout was the moving experience. I prepared a very nice Tilapia loin dinner with asparagus, zucchini, pear and fresh strawberries and I enjoyed a wonderful visit tonight with my oldest daughter Amber at her place across town. Her and I have some pretty powerful conversations! Both of my wonderful daughters remind me of me in various ways. I'm wearing my new "World's Greatest Grandpa" t-shirt. I was hesitant at first because it's a few sizes too old for me. Remember last week when I struggled against my desire to eat the catfish brought into the studio? I had already eaten my breakfast and was satisfied when the fish showed up, filling our studios with the smell of deep fried fish and chips. The fried catfish last Thursday morning was a preview for today's event. After last Thursday's struggle, I decided I would enjoy a catfish lunch today, making it a part of my food plan. I was fine as long as I found some accurate calorie information and brought along my food scale. What made last week so difficult was knowing that I wanted to eat it, purely for sport--driven by food lust. Today it was my planned lunch. The event today was the 8th Annual All-American Fish Fry Blood Drive with the Oklahoma Blood Institute. This critical blood drive is always scheduled right before the Independence Day holiday and serves as a boost to the blood supply going into what is typically a high demand holiday. It also serves as an opportunity for me to donate blood. I was on the air live when the needle was inserted into my left arm. I enjoy donating despite my fear of needles for several reasons. I know my donation can save up to three lives is the biggest reason. Another is because I wasn't always able to donate. At my heaviest I was turned away because of my raging high blood pressure. Donating now is a wonderful reminder that I'm not in that shape anymore and this is one reality check that feels very good. I also appreciate the mini health screening automatically accompanying each donation. 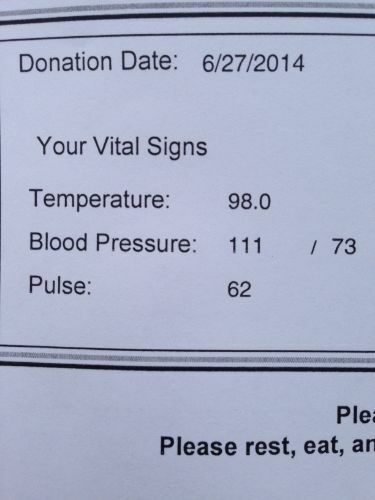 I received my vitals and an iron count (48) today. Soon, I'll receive my cholesterol numbers via mail. My pre-donation vitals were wonderful! This would not have been the case 9 weeks ago, I promise you. My food plan included the fried catfish today but I didn't want the baked beans and french fries being offered as side dishes. 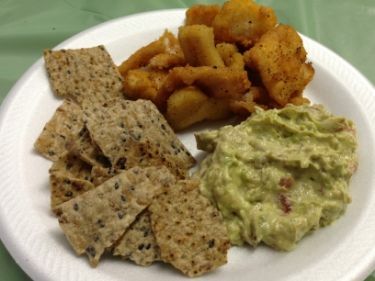 Instead, I brought homemade guacamole and a serving of wild rice chips. I also brought along my trusty digital food scale. The entire lunch totaled 543 calories. Today's event broke its record for most blood donors. The staff from OBI had to shut it down early because they were running out of critical supplies. It was a big success on all fronts. I felt prepared today and exceptionally calm. I declined the typical cookies and various snacks offered post donation, opting for lunch instead. I took the cookies last year and even some extra for the road. I'm a different person today. It was after 9pm when I discovered the calorie situation. I decided to get my workout in then decide if I was hungry for something afterward. I ended up with a good snack after the workout and another well after midnight as my #lastfoodofday. Why so late tonight? Once again Mother Nature called me into work for weather coverage. This has been happening a lot lately but I'm not complaining. I handled the day well. I feel accomplished. Short post tonight. Today was fantastic. I planned well, ate well, exercised well. I'm feeling great. Last night's post must have been bouncing around in my head all day because I had a dream during my afternoon nap where I was eating an ice cream bar. It scared me because it felt so real. I woke up and called Life Coach Gerri Helms and she suggested it was likely the result of recounting the Cracker Barrel experience. This is the first time I've had a dream where I'm doing something diametrically opposed to my plan. I don't care to have another ice cream bar as long as I live! I say that, because that's how wonderful this new found freedom feels. This is really hard for me, to just give a quick update and be okay. BUT, this is part of taking better care. My schedule tonight was a little misaligned. I got behind. I didn't finish my workout until 9:15, I didn't leave the grocery store until 10pm and dinner was super late. I enjoyed it though--oh my, did I ever! I came up with a new thing: Steak Fajita Pita Pizza. Ingredients for fajita pita pizza: Joseph's Pita (2), lean sirloin (6oz), mozz slice (3), sugar free marinara (1/2 serv. ), grilled veggies! I opened an email today from a high profile television production company. 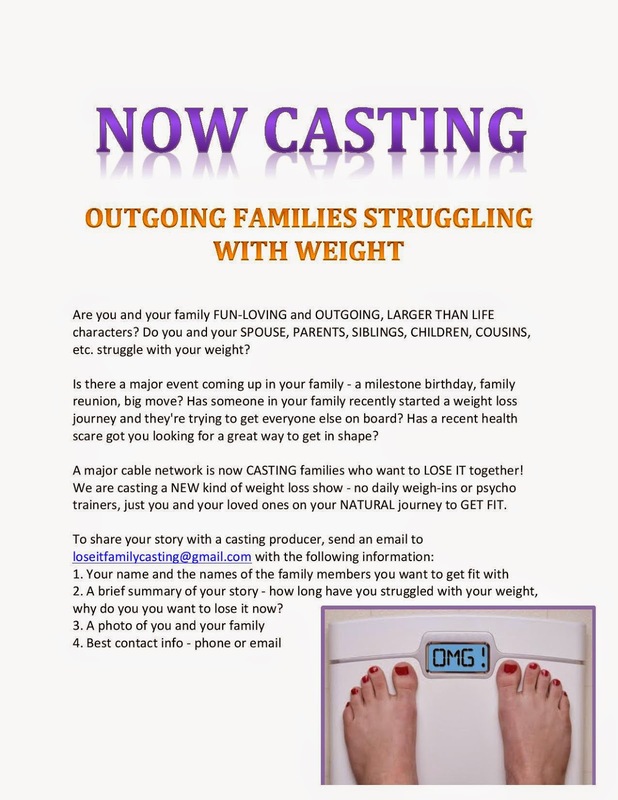 The producer contacted me to help spread the word about their search for families interested in being part of a weight loss reality show. If it sounds interesting to you, the contact information is on the flyer posted below. I promised to mention it and share their flyer. I also suggested they hire me as the host. :) I mean, really-- a host who is genuinely compassionate and understands first hand the dramatic ups and downs of this road we travel?? They need me on this project! Simply click on the image to enlarge the flyer. Improving my time management skills is proving to be a very tough challenge. It remains one of my toughest challenges of late. I'm off to bed! I spent most of the day with mom, taking her to an eye specialist appointment at the McGee Eye Institute in Oklahoma City. It was a wonderful experience as expected. We carefully packed "road lunches" before departing, each with a sandwich, cheese stick, three kinds of fruit and some wild rice chips. These served as both lunch and snacks along the way. It felt good to do the three P's: Plan, Prepare and Pack. I can't count the number of trips we've made over the years where the first stop was a convenience store for snacks or a fast food drive through on the way out of town. And if the trip involved going "to the big city," like today, then an elaborate plan to eat somewhere "special" was usually the main attraction. Would it be that big home style buffet on the South side or that Mexican all-you-can-eat place where whenever you want more food, you simply raise the flag? Yeah!! You don't even need to move from your seat!! Buffets where you actually have to get up and walk around? Forget that movement nonsense! 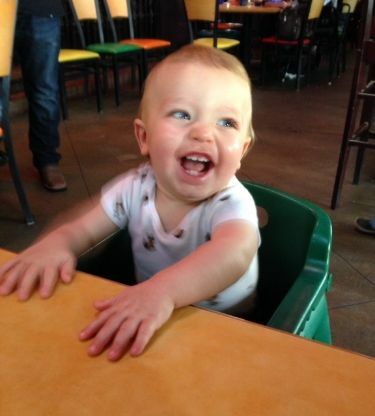 Poncho's Mexican Buffet is full service, baby! I always thought they needed two flags on those tables, the miniature Mexican flag for more food and a white one for when one more bite could trigger a medical emergency. I don't remember the exact date, it was either February or March. I had just dropped a friend off at Will Rogers World Airport and was headed home when I suddenly felt compelled to take the Cracker Barrel exit. I had been obsessing about their gravy since the pass on the way to the airport and there I was, all alone with a chorus of demons steering me toward the exit. I didn't resist. I walked in and immediately scanned the area for people I might know. I didn't want to get caught. This trip would forever be between me and a server whom I didn't know, I thought. I ordered the chicken fried steak covered in sawmill gravy, with extra gravy and extra biscuits on the side. I finished the giant portions but I wasn't done. I ordered more biscuits and more gravy. I must admit, it was slightly embarrassing to ask for more. In order to do it, I had to pretend I was someone else--because how could I do this?? I kept telling myself, I'll never see this server again. She didn't know she had become the dealer for my addiction. After finishing off at least six or seven biscuits and two bowls of gravy, not to mention the chicken fried steak, I decided to accept the dessert suggestion. Oh, she was good. Would I like some pie topped with ice cream?? "Oh I shouldn't, really." As if I was some kind of reasonable eater. "What the heck, let's do it. Sure." I was so busy eating everything I had fantasized about, I barely noticed how sick I was feeling until I walked outside. That was a long, guilty, shameful walk to the vehicle. At one point I seriously thought I would throw up. It was too much food. I was miserable the rest of the night, physically, mentally and emotionally. If I felt hopeless before this food excursion, my feelings had just been confirmed. I was recklessly headed straight back to 500 pounds in a way that suggested my thoughts and actions were not my own, instead from some insatiable monster inside me. The next day I vowed never again and I started doing well for a day or two, then it was right back to the Braum's Ice Cream and Dairy Store drive through for what had quickly become a very secretive late night habit of shakes and burgers before bed. When you read words I write about how grateful I am for the peace and calm I enjoy today, now you get a sense of how deep that gratitude flows. I've enjoyed more than two months of binge free living, more than two months 97% sugar free, more than two months of making additional support a priority and more than two months of not hiding anything. Posting a picture and calorie count of every bite, every day might seem excessive, but I don't look at it like that at all. It's necessary for me. I've gone from worrying this practice might be a big hassle to fully embracing and loving the record it's creating. It only works with extreme honesty. I understand, the second I eat something without the photo and tweet in a deviously secretive way, that's the moment it will unravel quickly and tragically. In this state of acceptance, matched with willingness, a solid determination and iron-clad integrity, I'm experiencing something like never before. Not even during my initial weight loss did I feel this much peace. I'm worth the extra effort. Recovery feels good, life affirming, really--after feeling hopeless, lost and scared in the grips of a powerful relapse. I hereby pledge to protect my recovery with the tools and practices successfully used by the countless people before me who continue to this day, living a peace that once seemed impossible to attain. Will there be struggles? Of course. And when struggle returns, it's up to me to immediately use the tools and practices of successful recovery in order to correct. One day at a time. Mom's appointment at the specialist was a good one. She has a macular pucker on the back of her right eye. It doesn't require surgery right now and it doesn't seem to be negatively affecting her vision too much right now. The doctor set her up for a 6 month return in order to track its progress. If the sight stays relatively stable, no surgery. If it worsens, they'll operate. Mom felt good about the trip and outcome. Going in, she was convinced he might want to operate on her eye immediately--and this scared her. I felt her relief when she realized this wasn't the case. After both of us started falling asleep in the various waiting rooms we toured over the course of three hours, we decided a coffee was in order before the return trip to Stillwater. Our visit wasn't focused on a "big city" restaurant visit, it was focused on quality time together--visiting, discussing--and laughing, then laughing some more and more. Of course we planned a nice dinner out upon returning home at one of our favorite places. We decided to share a single 1/2 order of chicken fajitas for dinner. Notice, of the handful of times I've eaten out in the last couple of months--fajitas, be it Hawaiian or simple chicken, have been the go-to order. I like it because it feels easily manageable. I have a pretty easy Mexican restaurant strategy to follow: If I do the chips (and I did), I separate mine from the bowl--count out my serving and that's mine--no more...eat 'em slow or fast, when they're gone--that's it. I ask for corn tortillas instead of flour (saves anywhere from 25-50 calorie per tortilla) and I choose to pass on the calorie dense rice and beans. I can confidently get in and out of a restaurant with these fairly simple rules. And it's not like I'm sitting there miserable the entire time because I'm not indulging in loads of chips and dips and sour cream enchiladas--My focus is shifted to the ones I'm sharing the meal with, in this case Mom...it's more an opportunity to relax and enjoy one another's company, rather than get stuffed. For me, once this shifted perspective is embraced, it dramatically changes the dynamics. I took mom home, grabbed my lunch supplies from earlier (she was excited about me leaving her some pitas and rice chips!) and headed for Boomer Lake on the North part of my hometown. I had an off day from exercise yesterday, so I wanted to make sure I had a good one tonight. I couldn't have made it back in time for the YMCA, so a good 5K walk was in order. And it was great. Thank you for reading! You can follow along on Twitter by clicking www.twitter.com/seanaanderson and if you're on MyFitnessPal, friend me! My username is SeanAAnderson. Every now and then I'll post a quick update, just touching the points of the day. This is difficult for me because I enjoy "exploring" through my writing. Unfortunately, some nights it's just not the best thing for me to indulge. And it is a joy, a healthy indulgence I do each night. I love writing, thinking, unraveling, unlocking and discovering deeper understandings of this road many of us travel. Sharing what I share helps me in so many ways. It's an extremely valuable element of my journey; a major part of me. And I love it. Tonight is one of these short posts. This is tough. I want to write about so many things I've thought about recently! I'll save it for another day. I was activated tonight for weather coverage and this meant dramatically changing my plans, or at least the order of events in that plan. It's important to be flexible. I wasn't able to join my weekly conference call support group until it was almost half over. Good thing Life Coach Gerri was ready to go solo. We do that for one another in times of special circumstance. I decided to make this the one day I pass on the workout. I'm at the point now where I look forward to it, so the dynamics of the decline has changed. Before, I would excuse myself because deep down I was dreading it. Tonight, I excused myself because getting to bed at a semi-decent hour is more important. Big difference. 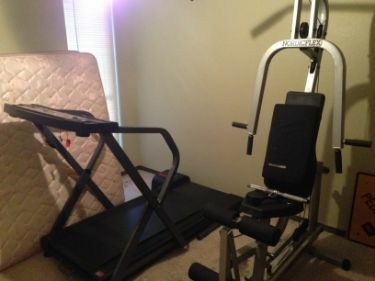 I'm not using my newly acquired spare bedroom workout facility until I purchase the necessary padding in an effort to reduce vibrations in this upstairs apartment. The very nice older lady who lives below me deserves my careful consideration of her peace and quiet! This is apartment living! There was a time when a missed workout would create a storm of negative self-abusive thoughts and feelings. Not even a little bit tonight. That's a miraculous change. From where did this change come? From a place of self compassion and self love, that's where it's found. I was baking a mushroom pizza cap when I was activated for weather duty. I refused to leave the house without it---I quickly plated that juicy, savory, melty thing and cling wrapped it up and into the man bag it went! It was a nice early appetizer to my burger and fries dinner that came much later. Tomorrow is a short day for me at work. 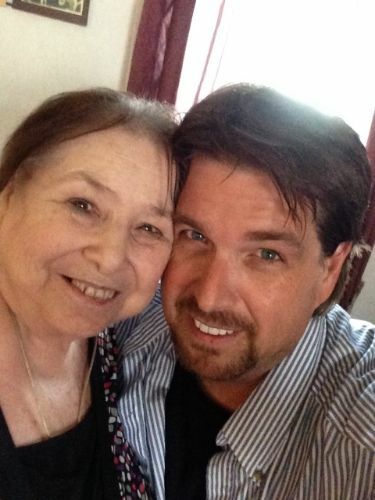 I'm leaving midday to pick up and transport mom to her eye doctor appointment in Oklahoma City tomorrow afternoon. We may have dinner out somewhere, haven't decided on the plan just yet. The storms rolled in last night and I was activated, covering weather until the early morning hours. I have done this many times and still made it through my show from 6-9am. I knew before I left the studio, there wasn't any way I could come back and do a show. I was a zombie. I left a note for a colleague to cover my show and it was decided, I was at least taking a half a day--personal day, sick day--whatever we needed to call it, I needed it! I slept until after 10am, got up and it felt like the weekend all over again. I slept well too. You know the kind of sleep where, maybe a handful of times a year you wake up and think--wow, that was the best, and you feel amazing?? It was that kind of rest. I'm only four and a half months removed from some of the worst sleep of my life and I can tell you, the first thing I do when I wake up feeling great is give thanks for this amazing blessing. If you've ever felt the frustration of severe untreated sleep apnea, where no matter how many hours you're in bed, you still look and feel completely exhausted--then you understand the joy of a good night of real, rejuvenating rest. Oh my--it's like you want to burst open your front door and prance through the neighborhood in your robe singing uplifting Disney songs. I've come close a few times. I cooked a big hearty breakfast!! I returned to work mid-afternoon for production and various duties. I made sure to pack some things for lunch. I left shortly before 5pm, ran a couple of errands, requested assistance in moving some exercise equipment into my apartment (more on this in a moment), thought about what to cook for a late dinner--threw a couple of dry seasoned chicken breast in the oven, wrapped in foil--changed clothes, headed to the store to get a few things I forgot last night, then to the YMCA for a good workout. After the Y, the chicken was still cooking at home while I met Alan, my ex-wife Irene's boyfriend and KL, my oldest daughter Amber's boyfriend. Alan has a truck. They both graciously agreed to help me pick up some exercise equipment from a friend's house and transport it to my apartment--and help me get it up the stairs and into my spare bedroom (which is currently being used for storage). It was almost impossible. Almost...we made it up the stairs with a little help from the insanely strong MMA fighter dude that lives in the building adjacent to me. Okay-- we don't know if he's really an MMA fighter, but we're pretty sure he could be one, easily. A very dear friend of mine surprised me about three or four months ago when he called to tell me he and his wife had agreed to gift me their big treadmill and Nordicflex weight training machine. They're moving away and they didn't want to take it with them. Rather than deal with the process of trying to sell them, they thought I would get a lot of good out of both and they wanted me to have them. Isn't that amazing? I've volunteered to help them move later this week. It's the least I can do to show my extreme appreciation. I waited this long to pick up the machines because I wasn't sure I could have them in my upstairs apartment. After careful consideration for the downstairs neighbor, I figured out a plan to minimize the effects of the treadmill vibrations. I'm going to buy a horse stall pad at the local farm supply store. It's a large, hard foam pad--the perfect size to fit underneath the treadmill. It will absorb the vibrations. The NordicFlex isn't a problem, it doesn't move in a way that might cause noise downstairs. The decorating will soon begin--as I transform my spare bedroom from a storage room into a workout room! I'm already thinking of cool posters and other inspirational things I'll put on the wall! The chicken enchilada crispy tacos were amazing tonight. I ran short on my calories, so a little more than an hour and a half after dinner, I had another taco with a side of cantaloupe as my #lastfoodofday. I'm continuing this trek back to a healthy weight with a new kind of stride. I welcome you to follow along on Facebook (www.facebook.com/seananderson505), Twitter (www.twitter.com/seanaanderson) and my username on MyFitnessPal is SeanAAnderson. Every weekend I tell myself I'll get it done and every weekend we get to this point and it isn't done. I'm writing about the list of things I can do to enhance what I'm already doing. It's like having a demented coach inside my head, pushing me further and never letting well enough be good enough. This internal dialogue is baloney because I am doing well and it is good enough. I planned on doing some precooking, design a vision board, look into what I need to do to get a weekly podcast started and dive into building a do-it-yourself website for a domain I've had reserved for the last two years. I could really be hard on myself right now. But you know what? Nah...I'm good. No more of that stuff. When the road is smooth and it seems like I'm on cruise control with food, exercise and the mental/emotional elements--my brain suddenly tries to take everything up a few notches. If we can do this, then we can also do this and that--and oh, here's an idea!! Settling down and just being okay is something that takes effort. It's like I'm scared of losing what I'm experiencing, so I automatically go into overdrive. Instead of beating myself up for not accomplishing certain tasks this weekend, I'm patting myself on the back for being okay. Because things have been very okay lately. I'm proud of myself. I'm grateful. I'm okay. What you fight against, fights back. What you embrace, you can influence and control. Ralph Marston is one of my favorite philosophers. You can see more of his work and subscribe to his site at www.greatday.com Check out Ralph's Monday June 23rd entry on his website titled "Peace and Quiet." Yes sir, Mr. Marston, I'm sincerely applying a healthy appreciation for peace and quiet. A coincidence he would have that message on his site when I'm experiencing the same dynamics. It's so fascinating how we often read or hear what we need at precisely the right time. You know what I mean? I enjoyed cooking breakfast and lunch today. I accepted an invitation from a friend for dinner. The menu was something I could do. While there, I traded services: I mowed the lawn and in exchange had my uni-brow waxed and eye brows trimmed and of course the dinner. I didn't immediately think of mowing as exercise, but why not?? It was a push mower and I was sweating! I decided to enter it into MyFitnessPal and yes, it was listed. According to MFP, I burned over 400 calories in the short 30 minute mowing. I was happy to do it. And my wildly hairy eyebrows look and feel much better now. In 20 to 30 years, I will have eye brows like the late great Andy Rooney, that is, if I don't stay on top of them! It's actually a blessing and I'm grateful for my good hair genes. This weekend has been a wonderful experience. I took advantage of the schedule-less time and got plenty of much needed rest. Did I do everything I wanted to do this weekend? No. And I'm glad I didn't. Today was mine. All mine. I mentioned last night how I planned to sleep in and I did! I slept late until almost 11am! It was so good, so refreshing, solid sleep. I needed it and I took it! I had a rare Saturday off. No schedule, nowhere to be--just a day for me. It was nice, but one thing was missing: The structure of a schedule. As confident as I am, as determined and spirited as I can be--still, the idea of having a day absent of structure in schedule was slightly worrisome. I'm up at 4:30am on a typical work day. I prepare breakfast and snacks, and depending on what I've kept in the fridge at work, I might pack something for lunch. I make sure I have everything I need food wise to get me through until late afternoon. The only variables remaining is a late afternoon snack, dinner and my #lastfoodofday. The structure of the schedule acts like gutter protectors used for little kids' bowling parties. On a day like today, the gutter protectors are pulled back and I must rely on my instincts to navigate the day as I create a schedule on the fly, without slipping into the gutter. I feel like I almost bowled a perfect game today without the gutter protectors. The only "complaint" I have is, often when I combine breakfast and lunch, I end up short on my calorie budget by the end of the day. I put quotations around the word complaint, because really--I have no real complaints. Things are going really well lately. I did end up with over 300 calories remaining for my #lastfoodofday, so I decided a sirloin and swiss melt dry-grilled (Foreman grill) sandwich on a 60 calorie Joseph's Pita with a side of cantaloupe would do just fine. And it was wonderful. Never mind that it was midnight. It's almost 1am as I write this post, so it's not like I consumed the 289 calories and immediately dropped in bed. The accountability system I've put in place is working wonders for me. This system plays a big role in keeping me "surrounded" by wonderful supportive people like you! I never feel alone, even when it's just me and a kitchen full of food and all day to do nothing if I so choose. Of course I took advantage of the extra time to get creative in the kitchen. I'm starting to get super passionate about cooking and experimenting with different foods and calorie values. My brunch today was one of those experiments. When I'm super proud of something, I'll also post it to my facebook page. Karsten, who has lost an incredible amount of weight and is still losing, commented that for him, the count was too high for a single meal. So I offered some modifications: "...totally understand your concern! Since I was combining breakfast and lunch, I opted for a higher count on this. The great thing is, it could be modified easily... Using two egg whites instead of four would make each crepe style omelet thinner, but still good--using 1/2 serv of sour cream would allow the flavor of the green chili sauce to come through better, using only one slice of swiss, cut in half--instead of two full slices wouldn't have had much impact on flavor or texture either...1/2 the avocado is an easy cal cutting strategy and of course 1/2 the fruit too... If all of these suggestions were followed, this delicious brunch would have checked in at a very reasonable 313 calories. Delish!!" The green chili cream sauce is simple--just mix 30g (40cal) of light sour cream with four tablespoons of green chili taco sauce. The flavor of the sauce, the melted swiss and the avocado made this meatless brunch out of this world good! I spent a good amount of time reading and commenting on blogs, catching up on emails and I even exchanged some support texts with a friend. When I stay connected with my weight loss blogging friends, I get a real sense of community. We are strong!! By the way--if you have a weight loss blog and you're not sure if I have it on my blogroll or not, please leave a comment with the address to your blog. I'd love to check it out! I'm excited to announce that a change in design is coming to this blog. You might say, "Sean--seriously, let it go--the person who called your blog ugly was being shallow and harsh. Stop taking it so personal." And I get that. Although the comment was the epitome of superficial and rather harsh, the anonymous poster did refer to the content as "interesting," before slamming the layout and design. I'll take that as a positive. Anyway, my point is--I heard from a bunch of people concerning this comment. Since I have an open mind and I'm willing to admit when good points are made, contrary to my own--I listen. And it benefits me in wonderful ways. I've always focused on content, not aesthetics. My attitude has always been: If the message is real and honest--helps me by getting it out and onto the page--and if it helps someone else, that's a bonus--but really, if it accomplishes all of that--then who cares what it looks like? Colors & design: Down to earth, simple, clean and straightforward, like you. Fonts: Casual handwriting at top, nothing pretentious; then American Typewriter for intro, like an old journal entry. Pen: Old and well worn, used a lot for this journey. Logo: CHOOSE CHANGE, forged steel look; iron-clad determination; forged in the fire of trials & triumphs. I'm beside myself excited about the upcoming change! It'll take a little while, maybe a few weeks. When it's ready, you'll know it because this blog will look amazing and be much easier on the eyes; easier to read. When it's done, I'll reveal the artist behind the design, reintroducing you to one of my favorite people in blogland! All of the content and features will remain the same, only the colors and design will change. I enjoyed a wonderful workout at the YMCA this afternoon. I sometimes like to pick a day to skip the workout and usually it falls on the weekend--and today would have been a decent day to skip, but I was feeling so good, I wanted to feel even better and a good workout always gives me a boost. I'm glad I decided to go. Arriving at the facility an hour before closing time on a Saturday is perfect because it's like you have the entire place to yourself. I really cut loose on the lip syncing this afternoon. It was fun! I received a text from a longtime friend this evening. He and his dad were in town for dinner and he wanted to know if I was available for a visit. I first met this friend when he was 12 or 13 years old and I was 19 or 20, maybe 21, I can't remember. His dad owned a radio station and I was applying for a job. Dave didn't like me at first, the new guy hired by his dad--but over the years, he softened and a relationship of mutual respect developed. I was there at his Eagle Scout ceremony and years later at his beautiful wedding. He's one of those people who naturally inspires you to be a better person, simply by being himself. Him and his dad both--great people. Oh, by the way-"the kid" Dave, is now an Emmy award winning television producer. I'm so very proud of him. I love these two guys. What a wonderful surprise to have them both a short drive away. We met at the studios downtown and had the most amazing visit. They both wanted to see Team Radio's state of the art studios built into an old historic (1927) vaudevillian theatre. We reminisced about the old days and laughed so much. It was an absolute pleasure. My only regret is, we didn't all mic up and record the conversation. It was that much fun. One of the things I recognized afterward, was the level of joy the visit brought me and how my current state of peace and calm certainly contributed to my ability to relax, be myself and enjoy the moments. In the middle of the darkness that surrounds extreme struggle, I wouldn't have been as receptive to the visit. I may not have even replied to the text message. It wouldn't have been anything personal toward them--it would have been me, waist deep in my own misery--isolating and not wanting to see anyone I didn't absolutely have to see. Isn't it interesting, the domino effect of feeling good about ourselves and who we are, what we're all about? It makes the things that bring us joy, even better. Everything is enhanced. It hasn't anything to do with the food and exercise, and everything to do with the identity/self-worth epiphanies discussed in the May 15th post. My Sean Day was a good one. I finished the day just under budget. I flexed my creative side in the kitchen. I exercised. I reached out in support of others (this element helps me too, tremendously). And I paused long enough to express thanks and gratitude for where I am today, with a prayer that I remain firmly on track. If you're on MyFitnessPal, friend me! My user name is SeanAAnderson. I use it to log all of my food and exercise--and it's updated with accurate weight loss statistics. My food diary is set to public, so if you see a food picture I've tweeted and you're curious about the ingredients and precise amounts used, it's all there! The one thing I rarely do on MyFitnessPal is interact. I've allowed myself to not be overly worried about this--because I am very active on facebook, twitter and this blog--so social media wise, I feel like I'm doing the best and most I can at this time. If you're into food pictures and calorie counts, my Live-Tweet twitter feed of everything I eat might be right up your alley. It's certainly not for everybody! The purpose of it isn't to be an example or anything like that--if you're a regular reader, you know my food philosophy--we're all different... and what I like, you may not. I maintain the Twitter feed for my own benefit. This accountability tool has been a giant difference maker for me of late. It's inspired me to not only eat better, but to slow down and enjoy my food more. If you're interested in the Twitter feed, simply visit www.twitter.com/seanaanderson You do not need a Twitter account to view the page and tweet history, only to interact. Getting to bed earlier last night made a profound difference in me today. Where before, my sleep apnea prevented me from feeling rested no matter how many hours I "slept," now, if I'm feeling exhausted it's me and my time management skills to blame. This is a good place to be. Because last night proved I can do it. I can get to bed at a decent hour and still accomplish all I'm requiring of myself. I had a great food day, a wonderful workout and the minor struggles of yesterday were nowhere to be found. I know they're lurking, out there--ready to jump from the shadows at anytime. The comforting thought is found in how I faced those challenges yesterday. I might have flinched, but I didn't give. It was empowering to overcome; felt really good. I've been eating a lot of homemade guacamole lately. I had a fresh guacamole omelet this morning and I enjoyed some again for lunch. Actually, it's one of those foods I must watch myself around. It's on the list with peanut butter (or any nut butter), cottage cheese, mixed nuts or peanuts and several other things. The difference is, I have some strict boundaries with my guacamole consumption. Number one--I must weigh and measure all ingredients. Number 2--I only make enough for one meal. I don't make a bunch and store it for later--that would be awesomely convenient, but I'm afraid I would keep going back again and again. Depending on my calorie budget, I'll either do a half avocado or a whole, depends on the size and weight in grams. Avocado is calorie dense good food. I know 100g is 160 calories. As long as I know the count, then I can build a nice serving within my limits--adding some light sour cream (1/2 serving), diced tomatoes, onions and a dash or two of ground black pepper and salt--and it's perfect for my taste! But again--I'm very adamant about my personal boundaries concerning this food. It's healthy. My past behaviors with it wasn't. After working out without my music last night, I made sure to have not one, but two pair of ear buds ready to go today. I have an incredible talent for interpreting lyrics to fit my situation. It's funny. Whatever the song, I can take it to a personal level real fast. Tonight was the Imagine Dragons "Radioactive." I'm convinced it's about recovery from addiction. "I'm breaking in and shaping up, and checking out on the prison bus. This is it, the Apocalypse, whoa... I'm waking up, I feel it in my bones, enough to make my system blow. Welcome to the new age, to the new age, welcome to the new age, to the new age. Whoa Oh, oh , oh , oh, Whoa, oh, oh , oh, I'm radioactive, radioactive." To me, the "Apocalypse" is a metaphor for the damage and havoc one creates while hitting rock bottom. The "new age" suggest recovery in a post "apocalyptic" existence and the "radioactive" suggests an awareness that one is forever affected by their transformation in this "new age." My brain immediately zeroes in and makes all the calculations needed to arrive at these wild conclusions. I could be totally wrong, of course. And it wouldn't be the first time! I interviewed Christopher Cross once and I told him how much I loved his song "Sailing." I briefly described for him what I took from the powerful lyrics and his reply: "I hate to shatter your interpretation, but it's literally about sailing." Oh well, okay then!! Lyrical interpretation is a fun exercise in creativity. If I had more time, I'd analyze Culture Clubs "Karma Chameleon," but it's bed time for this guy. I'm about to eat my #lastfoodofday and maybe watch something fun on Netflix before bed. I will be sleeping in as long and late as I can tomorrow. Oh yes I will! I was prepared today. Preparedness doesn't always prevent struggle. One of my interviews on the show this morning was Mark, an avid fisherman. He was coming in studio to promote the upcoming All-American Fish Fry Blood Drive with the Oklahoma Blood Institute. This will be the 8th year this man has caught, cleaned, prepared and cooked all of the fish for this big annual event. Every year, in advance of the date (usually the week before), he brings fresh fried catfish into the studio for everyone to enjoy. Today was the day. I love fried fish. I love fish, period. Even though I was fully satisfied with my breakfast, I was having a very tough time resisting the aroma of the fish and chips in the studio lobby. I tweeted about it, expressing "...I need to get out of here." In years past I've indulged on this day, but not this time. Sending the tweets about the fish gave me strength to walk away. Could I have eaten a piece and simply counted? Sure. But as solid and on plan as I've been lately--coupled with the fact that I had just finished breakfast and wasn't even remotely hungry, I made the right call. I don't feel bad for Mark, the fisherman, because plenty of others enjoyed the free fish. And he knows how I feel about his fish, it's the best! I left the studio not long after my show and when I returned after lunch, the crock pot of fish and fries still had several pieces. Yes, I checked. I had just finished a wonderful lunch of baked fish, sweet potatoes and pears. Again, I wasn't hungry, yet I was still compelled to check the crock pot. I didn't eat any. I quickly made my way to the upstairs production studio and dove into my work. After a couple of hours I enjoyed an orange before finishing the work day. I still needed to go downstairs and secure the on-air studios, which meant encountering the crock pot of what was now cold and old catfish and fries. It still smelled good. I came within an inch of eating it. I went so far as to remove the lid and pick up a few pieces. For a moment I thought, I can just count it, tweet it and eat less for dinner. Oh, I was doing my best to make it okay. At this point, considering the struggle, there was no way I was giving up. I put the cold fish back in the pot, returned the lid--acknowledged the glistening of oil on my fingers and the smell, then promptly went into the bathroom and washed it away. I walked from the studio feeling empowered. It showed me that just because I'm 97% sugar free, it doesn't mean I'm completely free from errant thoughts and occasional struggle. This situation was a different kind of trigger. It was the sight and smell. Had the food been a large pizza from Hideaway Pizza in my hometown, I would have experienced the same struggle. Had it been a giant pot of sesame chicken from Chinese Express--same struggle. I haven't had many of these types of struggles in the last couple of months because I haven't been around some of these foods. It was a good thing to experience this today. After deciding to grill something for dinner, I realized I forgot to take the meat from the freezer. No problem, I'll just go buy a small package at the store and grab a few other things while I'm in there. But when I pulled into the store parking lot I realized how tired I was. It had been a long day. Instead of shopping, then cooking--I decided to give myself a break from the kitchen and grab some Hawaiian Fajitas to go from my favorite little Mexican place. Out of the five or six times I've eaten out in the last few months, these Hawaiian Fajitas account for four times, including tonight. I implemented the same calorie saving strategy as I always do at a Mexican restaurant. Dinner checked in at 556 calories. I planned to workout after dinner but suddenly I didn't feel like it. Was I just too tired today, physically and mentally? Perhaps. I really like to reserve my "off day" from the workout schedule for the weekends. So I decided to drag myself to the YMCA. I arrived and realized I had left my earbuds at home. I wasn't driving all the way back home and back to the Y again for the music. I decided to go ahead and workout without my music. I made it through the workout, but I'll tell you--listening to people grunt and breathe isn't as much fun as getting wrapped up into Billy Idol. It took some focus to see it through. I'm glad I did. Today's theme has been struggle, in a few different ways. It may have started with the anonymous comment on yesterday's post that stated: "Your blog seems interesting but I cant get past the ugly layout." It was the epitome of superficial, this comment--and as much as it amused me, it must have bothered me a little too. My blog is as strong as the content and message, not to mention what it's done for me in so many ways and what others have told me it's done for them over the years. I take this blog seriously. I've never taken the time to "dress it up" or even consider a few changes to make it easier to read. Perhaps I do need to make a few changes to it, nothing major--maybe a bigger font or something, different color schemes...a prettier layout. I'm hitting the pillow much earlier than usual and that's a good thing. And despite the various minor struggles today, I'll hit the pillow knowing that I'm in just under budget, I exercised and I took extraordinary care of me today. Today was one of those rare days where I didn't snack. I'm getting away from the "snack because it's time to snack" mentality. If I'm hungry, I have something prepared and ready. My snack bag remained untouched today. I'll have something small before bed as my #lastfoodofday, but really, if I'm satisfied and not hungry, why would I eat? My three meals today were enough. I rarely have cravings but today I did. For some reason, I was craving fresh homemade guacamole. I was thinking about it on the elliptical at the Y. I decided, okay--guacamole it is! Since I started weighing and measuring everything, I'm a little less apprehensive about calorie dense foods--and guac can get that way quickly. Taking the guess work out of the equation has helped me expand my food variety. I've mentioned it before but it's important to point out again: I eat what I like. And the choices I'm making are made because it's where I am, now. I previously lost 275 pounds eating much differently. It wasn't right or wrong then and my eating habits are not right or wrong now. They're simply reflective of where I am today. I like what I'm doing. It's working for me. And that's key, in my opinion--finding what works for you. Discovering what you can do, what you like and how you like it. I don't like labeling anything "right or wrong-good or bad." Food is food. When someone asks me for advice on what they should eat as they get started along this road, I always tell them the same thing: Eat what you like, just set a budget and consistently stay within the budget. Trust that your choices will evolve in time. If you've been a regular reader of this blog from back in the middle of my initial weight loss, you might remember days where a Snickers Bar, Ice cream, fried mushrooms, cake, fast food cheeseburgers and Taco Bell all made their way into my budget. I don't look back on that time and think, wow--I didn't eat very well. I look back and think, that's where I was and needed to be at that time. Having been 500 pounds for so long, I instinctively knew that I wasn't going to change a lifetime of habits overnight. And I felt like if I tried, it would end up another failed attempt. In my opinion, the "nothing is off limits" philosophy is still valid and important, because it allows us to be where we are, be ourselves--growing and developing in a naturally organic way. We learn about ourselves along the way. I've learned that I can't do sugar. It took until just recently to arrive at a place of acceptance with this personal truth and for me, it's made a profound difference. But not everybody is a food addict or addicted to sugar, so giving up sugar may not be what's right for you. The main reason why I've always been a proponent of simplicity when it comes to food is because along this road it's about so much more than food and exercise. The mental/emotional/psychological elements in play are all bigger and more challenging than "what should I eat?" In my opinion, if the greater focus is placed on the food and exercise instead of the mental/emotional/psychological dynamics--then we end up facing the biggest elements unprepared. If you've ever heard someone say (or said it yourself): "I don't know what happened--I was eating as clean as possible and working out twice a day and I just crashed." It's my experience and opinion, a misaligned focus is to blame. There are no right or wrong foods. Eat what you like and allow yourself a natural evolution of good choices along the way. The practice of maintaining the integrity of a calorie budget can have a powerful impact on this evolution because we're trying to get the most value for our calories. And never compare what you're eating to someone else's food. Remember, we're all different. And sometimes the biggest mental hurdles come when we compare what we're eating to our own expectations or what we perceive to be what we should be eating. My best advice is to let it go. Just be you and give yourself room to grow and develop. I'm feeling better now, than I think I ever have in my life. That's a pretty big statement. I mean, ever, in the history of Sean. It has some to do with eating better, exercising and losing weight, of course, but the majority of this feeling comes from the epiphany of May 15th, 2014: My identity and self worth will never be tethered to the shape of my face, the size of my pants or the number on a scale. The same qualities and positive attributes I love about me are constant, at 505 or 230, for richer or poorer. Read the blog post from May 15th by clicking here. Never before has something stayed with me in such a powerful way. And it goes beyond recognizing and understanding. I've taken this into practical application in my everyday life and its effect has been nothing short of miraculous. I enjoy spending time with me. I don't think I've ever known what that was like until now. I have a greater confidence no matter where I am or who I may run into, I always hold my head high. What makes this exceptionally better is, I'm feeling great about myself, so when I'm around people I'm not busy projecting negative feelings about me onto them without their knowledge. In fact, it's the opposite. I think I'm awesome, so surely they do too! I don't tug on my shirt as much, as if doing so makes me appear slimmer. I don't look in the mirror and pepper myself with self-loathing and disgust. I look in the mirror with gratefulness and appreciation for what I have and what I don't have. I take extraordinary care in planning, selecting and preparing my food. I'm making me important. I even bought myself some new sweat pants today. I'm recognizing my talents and celebrating them--nurturing them, instead of discounting and under valuing. The added confidence has decreased my sensitivity, so I don't take things personally as often as I once did. I'm proceeding along this road with an excitement and vigor like never before. When someone compliments me on my appearance, I say thank you instead of launching into a laundry list of reasons to invalidate their suggestion, followed by --"but yeah, thank you for that." Just as importantly, I don't invest too much in what people say about me in a positive way. I don't gravitate toward them like a puppy with wagging tail and wanting eyes, saying give me more, give me more... and hoping if they say it enough I'll eventually believe it too. And I'm showing an abundant gratitude and thanks everyday for effectively being branded with two life changing experiences at the same time: The positive physical/mental effects of finally giving nearly 100% abstinence from sugar an honest effort and the mental/emotional freedom afforded by a new perspective on identity and self-worth. I'm also keenly aware that these gifts are not in any way locked into place. Only with my continued diligent practice, my constant awareness of where I am and a confident patience for where I'm headed, will I be allowed to keep the peace I currently enjoy. Only a fool believes he's figured out the combination for eternal peace without continued effort and practice. I've used the word "practice" a lot lately because it's what it is. I'm not perfect, never will be and that isn't the goal. The pursuit of perfection is the quickest detour to disappointment. I'm doing the best I can, today. Today was good in many ways. I had a productive morning show and afternoon production session. I left work, went shopping for myself (hardly ever do that), took care of a friend's dogs, then came home and started preparing an incredible meal. The food was almost done when I started my weekly Tuesday night support conference call, so I let it stay in the warm oven until the call was over. I enjoyed the meal tremendously--wow--Loved it!! I worked out on the elliptical at the YMCA after dinner, helped my oldest daughter with something--went back out to care for the dogs, then headed home to eat my #lastfoodofday and write this blog post. I had an interesting realization today. It required thinking of myself as two different people. First, there's the me in my deepest, darkest spiral, where the pounds came on easy and the quick fixes were easy to obtain in the numerous drive throughs less than a mile from my apartment. Second, there's me now--taking care, making things important like exercise and planning my food, and cooking and staying consistent AND losing weight. We'll call them Sean 1 and Sean 2. Sean 1: (mockingly) "Look at you and your blog and twitter, I swear if I see one more food picture from you... You don't get where I am, I mean seriously--you're not dealing with what I deal with everyday. And you're just so, on--always on---can you not turn it down a few notches...geez... I get it, you're logging, tweeting, blogging--doing what you do...spewing words of encouragement... Oh, and claiming that giving up nearly all sugar has given you a peace, where you're not compelled to binge--yeah, whatever--I don't believe that craziness. You can keep talking Mr. Anderson, it's still not helping me!" Sean 1: "Now hold on right there, you Joseph's Pita eating son..."
Sean 2: Uh Uh...no name calling. Sean 1: "I'm not a quitter. I'll never stop fighting." Sean 1: "...before change chooses me, yeah--I heard you the first 900 times you said that phrase..."
Sean 2: Why don't you come back when you're ready to really hear me. Sean 1: "Relax, Mr. Serious...geez...I was just giving you a hard time..."
Sean 2: I don't need a hard time. I've been really good at giving myself a hard time for a very long time, I don't need help in that department. Listen, what I'm doing now is what works for me. It's subject to change. And most importantly, it's not guaranteed. The best I can tell from studying others with long term successful maintenance is--I must keep a close guard--and stay diligent in my practice. It's paper thin, this difference between you and me--and if I ever decide to get careless and cavalier, I'll break through and be right back where you are now. This takes work. And I'm okay with that. Are you? Sean 1: "Why do you even care about me enough to share this?" Sean: 2: Because we share this road. And even though we may have very different circumstances and challenges, we have much more in common than not. We can learn from one another in wonderful ways. I want you to believe in yourself. I want you to truly understand, that if I can do this--you can too. There's hope, Sean 1--there's hope. Change your perspective and change your life, my friend. That's what I'm working on everyday, one day at a time. Today was a solid day. I had a great workout at the Y followed by a fabulous home cooked dinner with Amber, her boyfriend KL and a good friend of mine. I stayed within my calorie budget. I'm hitting the pillow tonight with gratitude for another good day. I'll wake in the morning with a prayer for another. I started the day with a good cup of coffee and a phone call to my dad. Dad and I don't talk enough, really. It was a good conversation and it ended with both of us vowing to make an effort to see each other again soon. I felt better having called and he expressed how much it meant to him, and that was a good start to my Father's Day. I'm dog sitting for a friend for the next few days. I requested full access to his large "gourmet" kitchen as part of the deal. My apartment kitchen is small and I do well with what I have, but this bigger kitchen is a lot of fun. If you ever notice different plates and table settings accompanying my food and exercise Twitter feed, you'll know--I'm dog sitting. I treated myself to a fantastic brunch today. This proved to be too much food. I left food on the plate and revised the count to 589 calories. It was a hearty He-Man type breakfast for this dad! I enjoyed dinner out with my oldest last night in celebration of Father's Day weekend. Today was another trip out, this time with both of my wonderful daughters and grandson Noah. Noah was in awe of his surroundings and fairly excited! He's playing the drums on the table. I've been eating out less than once a week on average for the last nearly two months. This weekend it was twice. And I'm okay with it as long as I have a plan and stick to it. And I did. 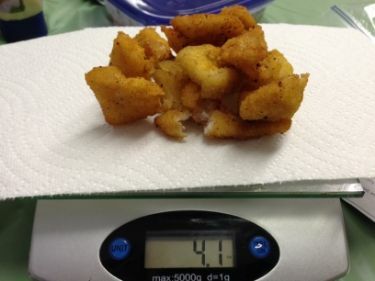 Last night I wrote about taking my food scale to the restaurant. I forgot to grab it for the trip today. Since I didn't have the luxury of my digital measuring device, I decided to be very detailed in my order. I asked the server how many ounces of chicken breast strips came in a half-order of fajitas, she immediately replied "four and a half ounces." I then expressed how important it was for the kitchen to make sure the serving was accurate. I declined the fresh made flour tortillas and real butter, I did not decline the chips and the chunky mild salsa. I counted out 12 chips and grabbed some of the fresca, and immediately calculated it in MyFitnessPal. I gave my rice and beans to Noah. I used corn tortillas instead of flour (the corn variety is almost half the calories of the flour kind), I gave away the pile of cheese on my "fixings" plate, and kept enough sour cream to smear a small amount onto each before filling with grilled chicken, onions and peppers. I used a little over half the chicken (approx. 3oz). They were easily the best chicken fajitas I've ever enjoyed. Here's the deal: My seemingly obsessive calculations aren't as obsessive as one might think. It's not about extreme accuracy for me. It's more about setting personal boundaries for my consumption. Calorie counting isn't an exact practice. It's almost impossible to be precisely exact with a perfect count. When I set good personal boundaries and I'm as close as I possibly can be with the count, I feel incredible about myself. Had I walked into that restaurant today with a different attitude and without a plan, I could have easily done some damage. And it isn't about physical "damage." We're talking mental/emotional damage. Don't get the wrong idea, I'm not advocating an occasional binge for me--That type of plan wouldn't work for me at all. Had I cut loose today in the name of Father's Day, the mental and emotional damage, not to mention the possible bio-chemical reactions, would have significantly trumped any possible physical damage. Suddenly, I would have been besieged with feelings of guilt and shame as a tidal wave of remorse and regret washed away this wonderful momentum I've created. The subsequent effects would eventually make dramatic contributions to the physical side of things. But that's just me. Here's the deal part two: I'm eating well and enough to feel extremely satisfied. I'm confident in doing what feels right for me today. I'm taking immense pride in a job well done. I'm not feeling deprived in any way. The contrast between this feeling and the highly familiar feeling of not caring, is night and day. I'm caring about me on a level I've never known. Not even during my initial weight loss was I this considerate and compassionate toward myself. This feels good. The best part of today wasn't the food. The best part was the family time. Enjoying a meal with both of my daughters, Noah, Mom, Uncle Keith, Aunt Kelli and her husband Tim was wonderful. I rarely have both of my daughters together at the same time. In fact, I'd venture to say we haven't all three shared a meal together in over a year before today. On the way home, as Noah slept and the three of us listened to music and talked, I had a few moments of clarity in reflection followed by extreme gratitude and thanks for being so blessed and so loved by my family. Amber and Courtney didn't know, but dad was getting a little misty at one point during our 42 mile trip home. It was a special day to me; just beautiful. I got back to my friend's house to let the dogs out and realized I still had slightly over 500 calories remaining in my Calorie Bank and Trust account. This happens frequently on the weekends because I usually end up combining breakfast and lunch into one meal. If my calorie spending isn't up to at least 850 or so by dinner time, I'll likely fall short at the end of the day. It's not a bad issue to have, really. I prepared a late "breakfast for dinner" steak and swiss omelet with a few strawberries on the side. It served as my #lastfoodofday. I jumped into my friend's workout room and onto his elliptical and...oh my... totally different style machine than I'm accustomed. I wanted to stop after 10 minutes. It was working different parts of me than my favorite at the YMCA. I pushed it to 20 minutes before calling it good. I was sweating more than when I do a full 30 at the Y. I will feel it in the morning, for sure. If you're a dad, Happy Father's Day! I hope yours was a good one too.